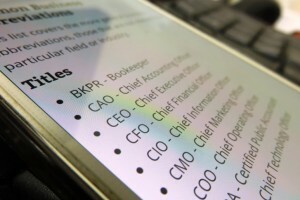 How well do you know your FAQs from your BPMs? Would you know when to RSVP? Don’t worry if these strings of letters seem baffling to you. Today we’re taking a look at 50 of the most useful English abbreviations and acronyms to help you navigate everything from official documents and friendly invitations to casual conversations in a nightclub. BYOB – Don’t turn up to a party empty-handed when you’ve been told to BYOB, else the hosts and the other guests will be dry and unhappy indeed. BYOB stands for bring your own beer/bottle/booze. ‘Bottle’, of course, means a bottle of wine or spirits, and ‘booze’ is a slang term for alcohol. DOA – dead on arrival. You might hear this abbreviation in hospital-based TV shows, when the victim of an accident or a crime gives up the ghost before they reach ER. Hopefully, you’ll never have to use it yourself. Oh, and BTW (see below), ER stands for Emergency Room, which is the US term. UK hospitals have A&E (Accident and Emergency) wards instead. DOB – date of birth, one of the most common English abbreviations found on official forms and documents. AD/BC – Not a tribute rock band. You’ll see these two used with dates. The first stands for the Latin phrase Anno Domini (In the Year of Our Lord) and refers to dates after the birth of Christ, while the latter, self-evidently enough, is used for dates Before Christ. Recently, however, the secular equivalents CE (Common Era) and BCE (Before Common Era) are becoming increasingly popular. AKA – also known as. This is used when referring to people who have a penname, a stage name, or some other type of alias, such as Reginald Dwight (AKA Elton John), Stefani Joanne Angelina Germanotta (AKA Lady Gaga) or Eric Arthur Blair (AKA George Orwell). ASAP – as soon as possible, something your boss might add to the end of an email when she wants you to finish that report as quickly as you can. Jack: Where’s Tom? It’s his round. Ben: Looks like he’s gone AWOL again. Typical! Always does a vanishing act when it’s his turn to get the drinks in. BO – body odour. This never means someone who smells like jasmine and roses. If someone has BO, you’ll be pinching your nose to avoid the smell. 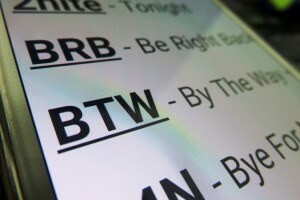 BRB – If you’re chatting to someone online, or via whatsapp or similar, and you need to take a sudden call or make a quick trip to the bathroom, this is the abbreviation to use, as it tells the other person that you’ll be right back. BTW – by the way. This is a common online abbreviation. ‘By the way’ is used to introduce a topic to the conversation that is not directly related to what is being said but which the speaker has just remembered. A good synonym is ‘incidentally’. DIY – do-it-yourself. This might sound like an order you might bark at someone, but in fact it refers to decorating your home by yourself or doing your own refurbishments or repairs, rather than employing a professional. EFL/ELT/ESL – Ask your English language teacher what these three related abbreviations mean. One of them is in the name of this very blog. No points for guessing what the E and the L stand for. BA, MA, BSC, MSC, PhD etc. – these are all academic abbreviations that describe the type of degree one is taking or has acquired. Respectively, they stand for Bachelor of Arts, Master of Arts, Bachelor of Science, Master of Science, and Doctor of Philosophy. There are many others. CC and BCC – These email abbreviations harken back to a time when copies of letters were made using carbon paper. CC means carbon copy and BCC means blind carbon copy. ETA – estimated time of arrival, used to let people know when you think you’ll arrive. FAQ – frequently asked questions. A common abbreviation on company websites, it’s cleaner than it sounds. Jack: Surely you weren’t out partying again, were you? You look wrecked, man. Ben: No, mate. FYI, I was up all night studying. IMO – in my opinion, another common internet abbreviation. You’ll also see IMHO, which can mean either in my honest or in my humble opinion. LGBT – lesbian gay bisexual transgender. This rainbow-esque abbreviation often adds a Q for queer and an I for intersex, giving it as many letters as there are colours in the flag it’s associated with. BLT – Not a series of sexualities this time, but a sandwich made up of bacon, lettuce and tomato, plus a slathering of mayonnaise. EDM – electronic dance music, such as house, trance and techno – the kind that has lots of BPM (beats per minute). LOL – laugh(ing) out loud. 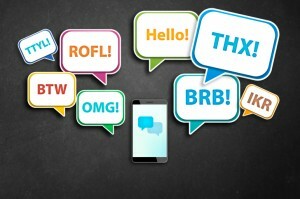 These days, LOL is one of the best-known and most useful English abbreviations, both online and in text messaging and in social media, so much so in fact that it has entered the spoken language as both a verb and a noun. You might hear someone with a GSOH (good sense of humour) say they ‘lolled’ at something funny, or even that they did something ‘just for the lulz’, meaning ‘just for the fun of it’. It can also mean lots of love. NEET – This fairly new abbreviation is used to refer to a young person who is not in education, employment or training, a state of affairs which is not that neat. OMG! – Oh my god! This very old expression of surprise or disgust has become one of the better known online abbreviations. P.S. – post scriptum. Although seen less and less frequently now that we have email and editing, these two letters still constitute a widely understood abbreviation for adding something to a finished letter. There are hundreds of others from Latin still in common use. PTO – If you see this at the bottom of a document, make sure you follow the instruction to please turn over and read the other side. RIP – Technically from the Latin requiescat in pace, it’s more commonly understood to stand for the English words rest in peace. You’ll find it on gravestones and tombstones. RSVP – For the French répondez s’il vous plait (please reply). If you receive an official invitation to an event that includes this abbreviation, make sure you let the organiser know whether you’re going or not. TBA – to be announced. If you’re planning a get-together but haven’t yet chosen the venue, this is the abbreviation to use. Also TBC – to be confirmed. VIP – very important person. You’ll hear this used of those rooms in clubs and boxes in stadiums that are reserved for the rich and famous. It’s always pronounced fully as V.I.P. and never as ‘bip’, as it is in some languages. TGIF – thank god it’s Friday. This needs little explanation. YOLO – you only live once. Yolo someone to encourage them to carpe that diem and seize the day, otherwise they might suffer from FOMO (fear of missing out), that disturbing aspect of the human condition that makes you feel that everyone is having a better time of it than you are. TL;DR – too long; didn’t read. This is used on internet discussion forums when someone has posted something longwinded and verbose. Hopefully you won’t be thinking TL:DR of this blog post. LOL! This entry was posted in English language and tagged abbreviations, acronyms, English language, English online, textspeak by Daniel Vincent. Bookmark the permalink.